About Us : Barkart!, Natural art with bite! John Gray is an Australian Wildlife Artist who has created his own very different and unique way to present his sought after artwork. In the very competitive world of art it is a pleasure to see a fresh, innovative and unusual idea, emerge. John concentrates his talent on the many different and fascinating native fauna that inhabit the vast Australian Continent. His fascination with the Native Bird population especially dominates his wide variety of works that he has painted prolifically over the past six years. John has based himself in the wonderful surrounds of Cairns in Far North Queensland. Cairns is world renowned for its' lush natural rainforest and the magical delights of the Great Barrier Reef, both of which enjoy world heritage status and protection. Living in the rainforest and been surrounded by such beauty inspires him to paint daily. John paints Native fauna directly onto the surface of specially prepared paperbark collected under permit from the Melaleuca Tree species. With a combination of the wonderfully attractive grain and texture of the natural paperbark, accompanied with Johns ability to paint and capture the essence of the creatures spirit, result in something to behold, treasure and appreciate. His bird paintings are particuarly different because once a painting has been completed , John subtly adds real feathers to it. This not only shows the viewer the beautiful, vibrant, true colours and intricate patterns of the birds feathers, it allows for a unique 3 dimensional look to the overall image, creating a unique, very special piece of Australian art. John stresses that NO TREE NOR BIRD ARE EVER HARMED to accomplish his work. It took many years to negotiate with the Federal and State Government bodies for this licence. As John says, I don't mind paying quite a substantial amount per year to the Government for my licence, as its primary function is too stop unscrupulous people from killing our native flora and fauna for commerical gain. Any protection for our native flora and fauna from the Government I support whole heartedly and applaud. All artworks and feathers are supplied with an Australian Government Licence Number to support the legal purchase of your item. The paperbark he uses is soft and each piece is unique in texture, fibre and grain. When the bark is treated ,using a technique that John invented, the surface becomes preserved and ready to paint on. He uses primarily water-colour paint applied thin layer upon thin layer until he has built the colour intensity up to his satisfication. He does not believe in the traditional wishy-washy opaque technique that most water-colourists use. When John completes his painting of his chosen subject, he adds his feathers to selected areas of the painting which enables the viewer to see for themselves the TRUE colours and patterns of the feathers. John says: Even though I could paint these feathers, I cannot do the colours and intricate patterns justice. He then backs his completed bark painting onto a solid black background for mounting purposes. The black background brings out the grain and texture of the bark, even more. The end result is a unique piece of attractive, natural looking , Australian artwork. Each piece of original artwork differ from one another because no two feathers or bark are indentical in shape, grain, colour or pattern. Whether you purchase for yourself an original or quality print from Johns' extensive range of artwork, or a gift for someone special, you will truly appreciate his talent and the uniqueness of his art. Australian Native Fauna painted on Melaleuca Paperbark. 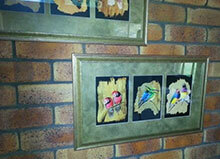 All bird paintings contain either Real Feathers or printed version. No two originals are the same. No trees or birds are ever harmed to create John's art. Life-like portrayals of Native species. Use of Native Bird Feathers are under Australian Government Licence. Each piece of artwork is totally unique.